FourFourTwo magazine has launched a spin-off website that helps footballers improve their game, sponsored by the Coca-Cola-owned sports drink Powerade. FourFourTwo Performance, built by customer publishing agency Haymarket Network, has professional advice for footballers of all abilities. It uses the strapline "Think. Train. Play. Like a Pro," and claims to improve any player's game within 10 minutes of visiting the site. 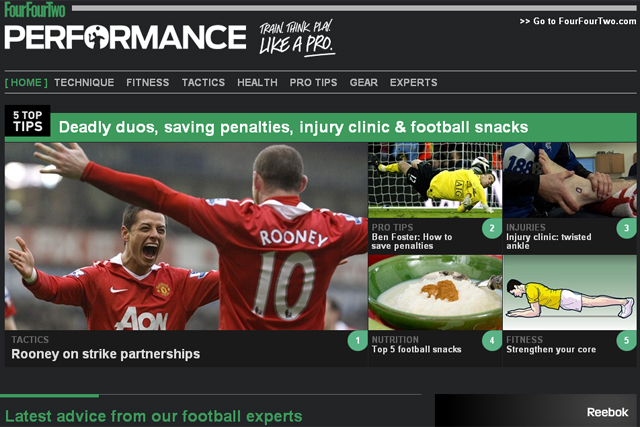 The site has contributions from professional footballers such as Rio Ferdinand, Ashley Cole and Wayne Rooney, and has sections covering technique, tactics, fitness, nutrition, injuries and psychology. Hugh Sleight, brand director at FourFourTwo, said: "We felt there was a real opportunity to deliver unique and useful content to footballers that would help them improve their game. "Look around and there's precious little out there that delivers meaningful advice to footballers. Our belief is that whether you’re 14 or 40, playing professionally or in the park, there's something here for you." The site complements the 10-page Performance section launched in the monthly magazine last September. Powerade has signed up as the official sports drink sponsor for the site and the magazine section. Slight called the sponsorship a "perfect fit". He said: "Powerade operate at the very elite level of sport but with practical applications right the way down to grassroots football. "We're working with them to use their experts to teach our readers all about fitness, nutrition and the importance of hydration." Haymarket Network and Media Week are both owned by Haymarket Media Group.